Equinox® Silicone Putty Products are new silicone compounds (platinum catalyst) that can be easily mixed and applied by hand to a variety of surfaces. 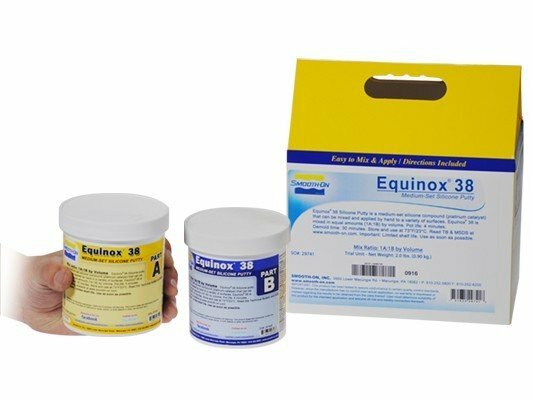 Equinox® Putty is mixed in equal amounts (1A:1B) by volume. 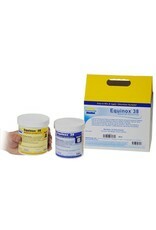 Equinox® 38 has a pot life of 4 minutes with a cure time of 30 minutes. Shrinkage is low and cured rubber is exceptionally strong (very high tensile strength), durable and will resist high temperatures (for casting low-temperature melt metal alloys). They also resist cure inhibition. Equinox® Silicones are also FOOD SAFE and can be used for culinary applications. Applications include making fast mold impressions from almost any surface, orthotics / orthopedic, equine hoof repair, jewelry making and more.